Pope Francis has warned that a recent wave of jihadist attacks in Europe is proof that "the world is at war". However, he stressed he did not mean a war of religions, but rather a conflict over "interests, money resources". He was speaking ahead of his visit to Poland to reporters seeking his comments on the murder of a Catholic priest by French jihadists on Tuesday. Father Jacques Hamel was killed at a morning mass in his church in Saint-Etienne-du-Rouvray, northern France. The killing was the latest of a spate of attacks carried out in France and Germany over the past few days and weeks, many of them attributed to Islamist militants. "The word we hear a lot is insecurity, but the real word is war," the pontiff said. "We must not be afraid to say the truth, the world is at war because it has lost peace. "When I speak of war I speak of wars over interests, money, resources, not religion. 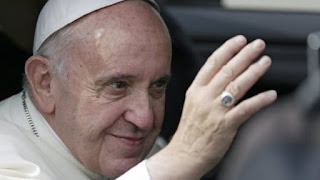 All religions want peace, it's the others who want war," Pope Francis added. He later arrived in the southern Polish city of Krakow, where he is due to speak at a gathering of young Catholics from across the world. 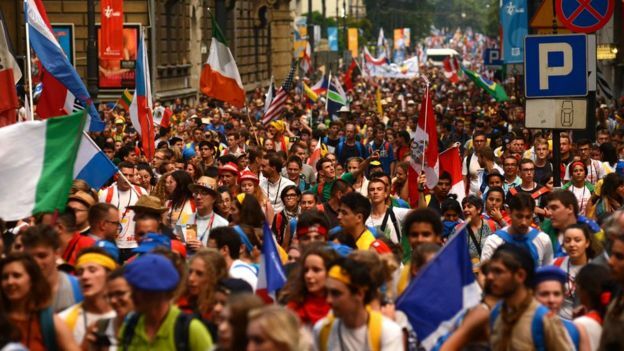 The World Youth Day is expected to attract hundreds of thousands of people. Ahead of the visit, the Vatican appears to have toned down criticism of Polish politicians' views of migrants. A Polish bishops' spokesman had blamed "inappropriate" political discourse for creating an "artificial fear of Muslims" in the country, according to a report in La Stampa newspaper. But the remarks later appeared to have been removed from the Vatican website. Pope Francis' support for migrants has put him at odds with Poland's anti-immigrant right-wing government, which has refused to take part in an EU deal to take in refugees, citing security reasons. In the Vatican statement, released on 23 July, Fr Pawel Rytel-Andrianik said "great fears" existed in "ethnically homogenous" Poland, where the concept of immigration was "new, different and strange". "Unfortunately these fears are fuelled by some political parties, and inappropriate statements made by politicians. There is an artificially created fear of Muslims, understandable indeed in some ways (because of terrorist attacks)," La Stampa reported him as saying in remarks that have since been removed. "Poland borders Germany, which has a large Muslim population, and on the border they do not run some regular checks," he added. In the apparently revised Vatican statement, Fr Rytel-Andrianik also blamed a lack of public debate or a system for teaching Polish people about diversity in a country where he said foreign-born people make up just 0.4% of the population. In Krakow, the Pope met Polish President Andrzej Duda in the Wawel Castle before retiring for a closed question-and-answer session with the country's bishops in the city's cathedral. Much of Poland's conservative Catholic establishment is uncomfortable with Pope Francis's push for a more flexible and compassionate church. 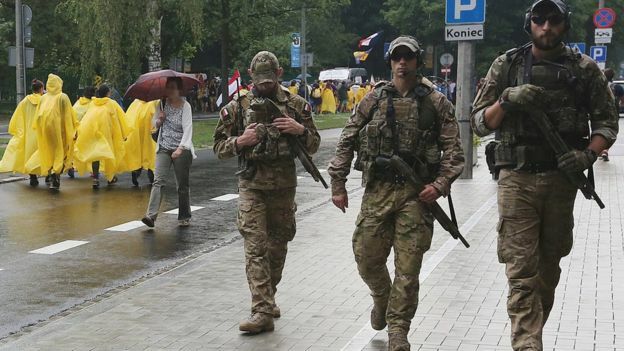 Poland is deploying over 40,000 security personnel for the visit.